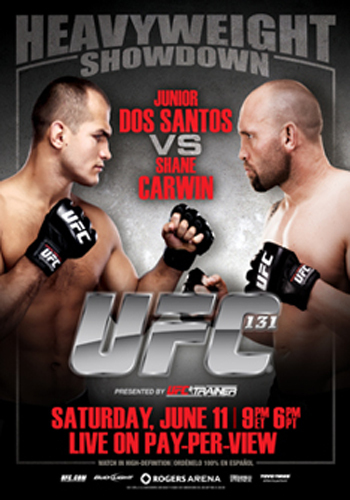 The official poster for “UFC 131: Dos Santos vs. Carwin” isn’t the most creative billboard in Octagon history, but it certainly gets the job done. With the abrupt exit of Brock Lesnar from the card’s main event, a simple cut and paste job allowed Shane Carwin to be featured opposite Junior dos Santos in the latest ad. The star-studded show takes place June 11th inside the Rogers Arena in Vancouver, British Columbia, Canada. Carwin and dos Santos will determine who gets first crack at Cain Velasquez’s freshly minted heavyweight title in the night’s featured contest. Spike TV will offer up a pair of free live prelims at 8PM ET/5PM PT to kick off the festivities. The pay-per-view broadcast starts immediately after at 9PM ET/6PM PT.